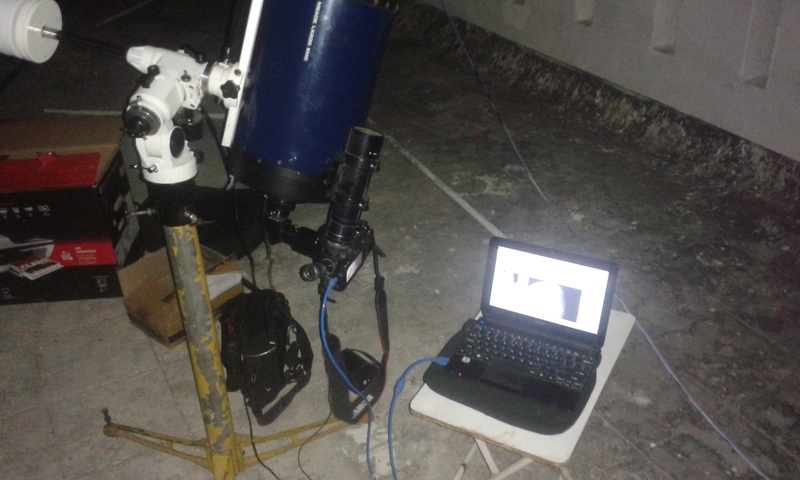 Instruments: Meade LX 200, 8 inch SCT telescope, EQ-3 mount, Canon 600D, Barlow 2x converter, T-ring, Tripod stand for EQ-3, Intervalometer, Acer Laptop and accessories. 18:50 Begin assembling the tripod stand, EQ-3 and the optical tube. 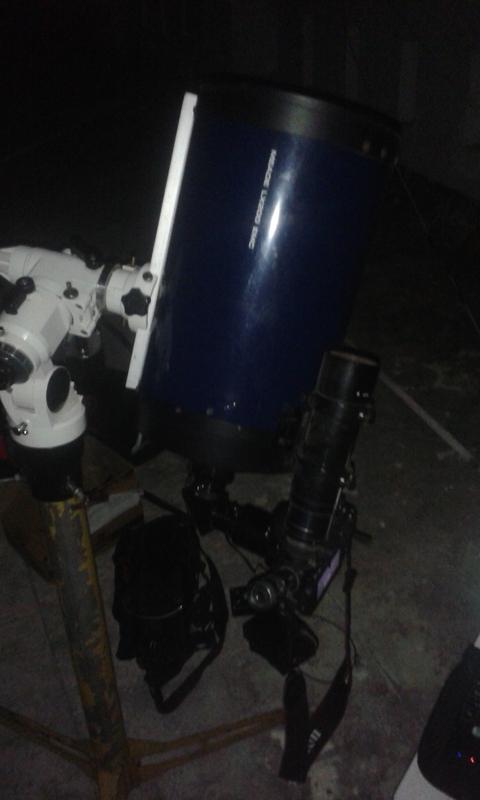 19:04 R.A. Motor connected and telescope polar aligned New batteries would be needed soon. 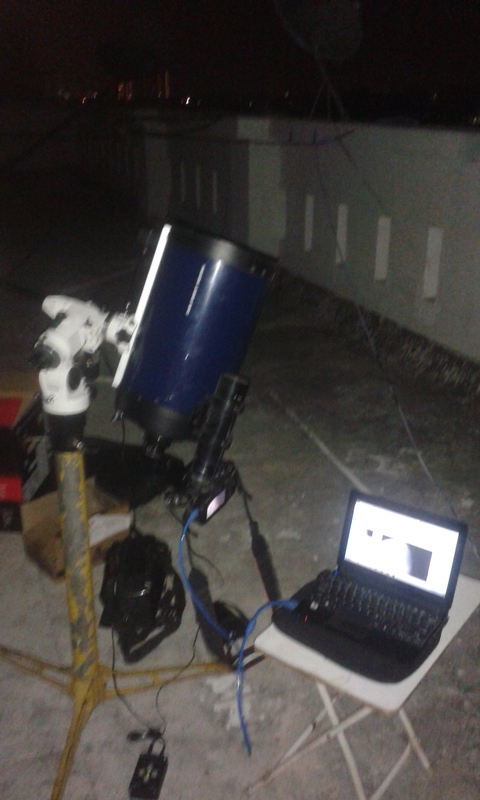 19:15 DSLR attached to the telescope and appropriate balancing of counter-weights done. Today it did take quite some time to get the balancing perfect. With a 2x converter connected it can get difficult. Using the laptop and Digicam control software. I began observing the moon and this time since the controls were with the computer only wind vibrations were affecting the image stability. Proved to be helpful. With a 2x Barlow Moon drifts quickly if the polar alignment is wrong. Images on the laptop looked well focused for a 2x converter. The elbow became lose at some points with the 2x ON it. 20:45 – 21:35 Observed Venus, Jupiter and Saturn. The phase of Venus looked very apparent with the help of 2x converter. Jupiter’s bands and Moons were visible as well except that it is a much better view with an eyepiece. 21:35 to 22:00 Tried hard to observe M51 as the city sky was quite light polluted. Didn’t attempt to photograph it using the DSLR as the elbow was having some issues. The Meade finder scope proved to be helpful with the star just at the center of the cross-hair and subsequently in the eye piece. M51 is just a small spec of dust from here. 22:00- 22:30 Observed Saturn once again. Fixed the balancing issue of the counter weights to ensure smooth functioning. Skies are beginning to get cloudy. 22:50 – 23:30 Just observed the moon and its craters along the terminator. Absolute visual treat. Final summary of what all went right and wrong today was also done. 23:30- 00:00 Pack up and closing of the instruments. 00:05 – 1:00 Data transfer to laptop and conversion of .MOV files to .AVI using Virtual Dub. This entry was posted in observing log. Bookmark the permalink.